What Should I Wear When I Go Snowmobiling? Home > Equipment > What Should I Wear When I Go Snowmobiling? 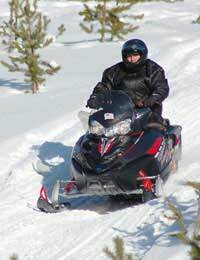 Snowmobiling, while great fun, can prove to be one of the coldest experiences of your life! To compensate for this, you can now get snowmobiles that have heated handles, and the clothes that you can buy or hire for snowmobile trips are well insulated and warm. Where Can I Get Appropriate Snowmobile Equipment and Wear? As with most winter sports equipment, the clothing and equipment you need for a snowmobiling trip is easily sourced from a hire outlet on a resort. Most rental outlets will have everything you need to make your trip comfortable, including one and two piece snowsuits, helmets, boots and other equipment. You can also buy equipment from retail outlets on resort but make sure that you get the appropriate advice from the store as some clothes may look suitable for spending a day in the snow, but in fact will turn out to not be warm enough at all.You’ll need a proper snow suit, either an all in one or a two piece trouser and jacket suit. This acts as a top snow defence layer, keeps snow out, softens the impact of the wind and keeps warmth in. One of the most important things to remember is that you’ll need a face mask or some sort of balaclava type headgear to defend your face against the biting cold! The wind chill factor of a snowmobile travelling at 70mph is likely to be quite high so don’t miss out this element of your clothing! For the same reason, make sure you have proper gloves, and make them long enough to come all the way up your wrists. You don’t want to get cold hands – not all equipment handles are heated and snowmobile treks can feel very long when you have cold hands! Clothes wise, also try to wear layers that are easy to remove. Many snowmobile style trousers have a full length zip down the leg so that they can be taken off easily after a trek. Make sure they are nice and long to avoid too much leg exposure while riding. Wear a turtle neck or polo neck top under the suit, because the extra warmth on your neck area really helps to keep the warmth in. You’ll need to start with some warm socks, preferably in a natural material like wool or thick cotton. Wool socks can also help to keep your feet dry. Hire or buy yourself some proper snow boots, too. There are plenty to choose from and you’ll be able to get advice on the best fit and best type for snowmobiling if you ask one of the people in the hire shop. Make sure that the boots you choose at least come up to the mid-calf area. While you are sitting on the snowmobile, trouser legs do have an unnerving ability to ride up and if your boots aren’t long enough your legs will get really cold! Make sure that your boots that have waterproof soles, too. Wear the right equipment for your snowmobiling expedition and hopefully the cold won't be the thing you remember most when you get back! Winter Accommodation: Hotel, Cabin or Lodge? What Should I Wear When I Go Skiing or Snowboarding? Snowboarding Equipment: What do I need? Should You Have Ski Lessons Before Your Ski Holiday?